If you have any questions or suggestions you are welcome to join our forum discussion about Channels and Breakouts in Price Action. Within a larger channel it is possible several smaller channels to be spotted, as shown on the chart below. Most of the channels here appeared to be tight. As they had no pullbacks or small one-bar pullbacks and lasted for less than ten bars, they can also be considered as micro channels. We shall discuss them in our next article. In case prices break out from a channel and then return inside this channel, a test at the opposite side of the channel may be expected. What is more, often prices break out from the opposite side. In case this breakout is of considerable magnitude, the first target may be at least a measured move, which equals the height of the channel. On the chart above bar 3 breached the upper area of the horizontal channel (trading range), after which the price reversed its direction. 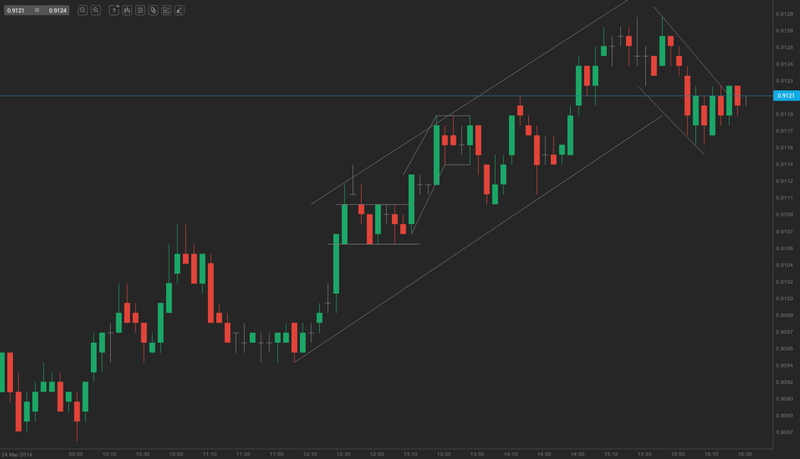 A breakout from the opposite side of the channel has occurred, as the large bear trend bar had a low price at a distance twice the height of the channel. Here we can see another similar scenario. 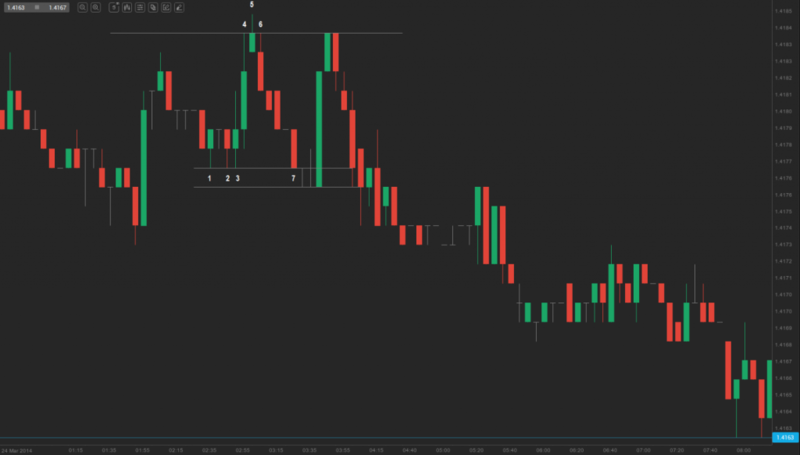 The market broke out from the horizontal channel (trading range) with bar 5, but then the price returned inside the channel and tested the lower area with bar 7. Bull channels can be detected in any type of market. 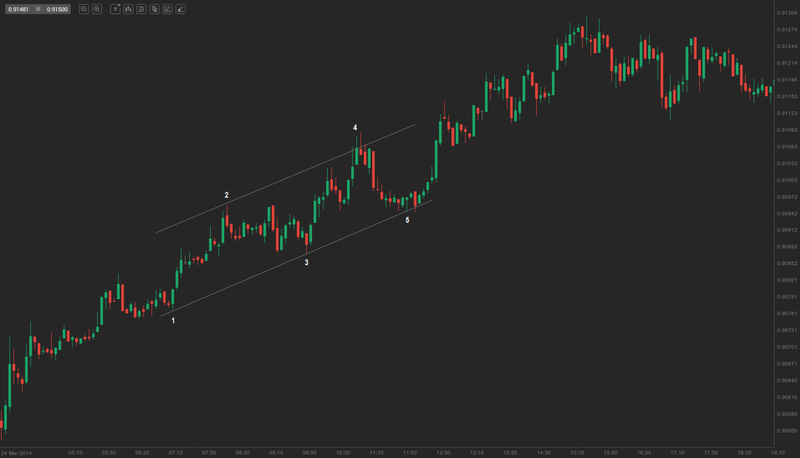 On the chart above we can see a bull channel, that formed in a strong uptrend. Prices moved up during most of the trading day, while no pullbacks occurred. In case any pullbacks were to be observed, traders would have probably bought them at or below the low price of the preceding bar. 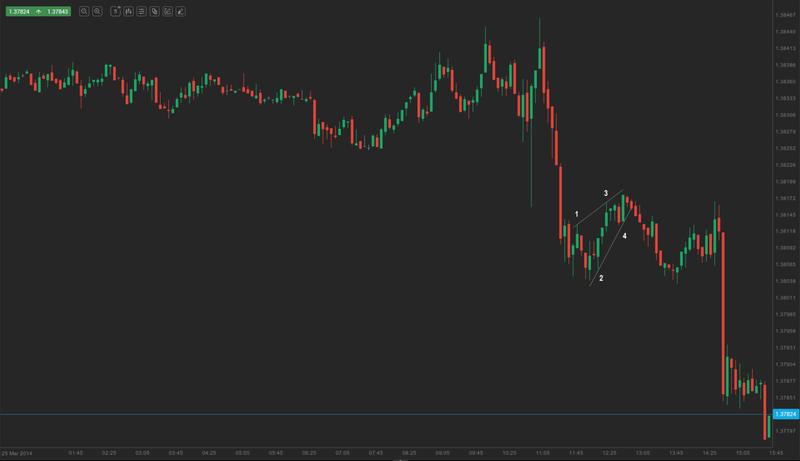 On the chart above the bull channel, that formed, was actually a wedge bear flag in a downtrend, thus, it was not appropriate to look for a long entry in the market. A short position could have been entered above the high price of the shaved bull trend bar or on any of the several bars following it, because the market became always-in short. If the price manages to break out from any channel, the first target is usually a measured move. On the chart above, we can see another bull channel. Line X is drawn across the high price of bar 5, while line Y is drawn across the low price of bar 6 (the bar, which breaches the trend line). Line Z is a measured move down from lines X and Y. Bar 7 found support at the measured move and the price continued to climb.